Joseph Francis, left, mixes ingredients for his Pranam Superfoods “antioxidant bars” while talking with LSU AgCenter Food Incubator food scientist Marvin Moncada on Feb. 22, 2019. Photo by Olivia McClure. 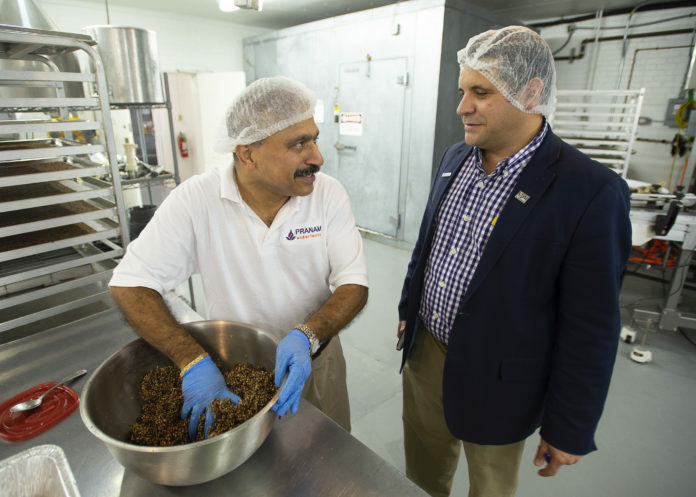 Launched in December at the LSU AgCenter Food Incubator, Joseph Francis makes four flavors of his Pranam Superfoods “antioxidant bars.” They are already being sold in eight stores in Baton Rouge and seven others elsewhere in Louisiana. The snack bars are made with quinoa—rather than oats, a more common base ingredient for such products—and a mixture of antioxidant-rich fruits and nuts. They are sweetened only with honey. All ingredients are organic, gluten-free and vegan-friendly. The bar evolved from a drink that Francis made in his kitchen at home using blueberry powder and some spices. Francis eventually decided on making snack bars with similar ingredients and soon enlisted the help of the Food Incubator scale up his recipe and mass produce them. Read the full story from LSU.